Think innovation only happens in big cities? Think again. Forget moving to the city to launch the next big thing only to become another face lost in the shuffle. Entrepreneurs everywhere are finally waking up to the fact that there is a better way. 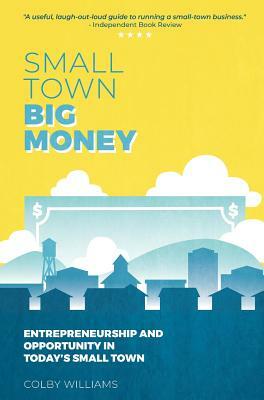 Small towns are ripe for entrepreneurship Whether your goal is to start a business in the hopes of financial freedom, to gain a competitive advantage by cutting costs, or simply to make your small town better, Small Town Big Money shows you how. Discover why entrepreneurs are moving to small towns. Find out how small town entrepreneurs build brands that compete on a global scale. Learn what civic leaders are doing to build small towns that entrepreneurs want to call home. With humor and practical insight, Colby gives readers a peak under the hood of the small town entrepreneur life. Small Town Big Money must be the next book about business you read.